Heel pain is a painful condition that effects everyone from busy moms, to active kids, and especially athletes. Typically patients have the most pain first thing in the morning or after sitting for long periods of time. Heel pain is usually caused by overusing your feet or starting an activity after not being active for a period of time. Lastly, excess weight can contribute to pain in your heels. There are a few treatment options available for heel pain. Our office strives to treat our patients conservatively (without surgery) before we explore further options. The easiest way to start treating your heel pain, and a way to treat heel pain at home is through stretching and exercise. 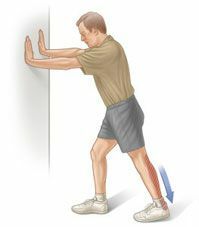 A few simple moves can help to stretch the ligament that is causing your heel pain, the plantar fasciia. In this video, we demonstrate a few stretching exercises that can help to reduce or eliminate heel pain. There are more intense work outs that have ben shown to reduce heel pain as well. If the stretching or exercising are not helping to relive your pain, you should consider professional methods to treat your heel pain. Treatment options for heel pain can include orthotics to correct the biomechanical issues that could be causing your heel pain, In addition, proper foot wear, shock wave therapy, cryotherapy, and MicroVas are all noninvasive to minimally invasive treatment options. Your need to get to the cause of the problem to properly treat the issue and prevent it from coming back. If your heel pain does not get better, call our office to discuss the best treatment options for your lifestyle.